Derry, NH - Derry, NH -- In a small basement office in Derry, New Hampshire, Labor Secretary Tom Perez made what is fast becoming the popular closing argument for Hillary Clinton as president of the United States over Sen. Bernie Sanders. “Progressives make progress,” Perez said to Clinton volunteers on Sunday. Perez is one of three Obama administration officials to have endorsed Clinton – Agriculture Secretary Tom Vilsack and Julian Castro, who heads Housing and Urban Development, pledged their support last year. Perez’s weekend stumping for Clinton comes as another wing of the administration, the Justice Department and the FBI, are conducting a federal investigation into whether she mishandled classified material by using a private email server enters its seventh month. Perez, who was branded a radical by Republicans for his tenure in the civil rights division of the Justice Department before becoming a cabinet secretary, said that Clinton had shown herself to be a fighter, taking on the healthcare industry and campaigning for women’s reproductive rights, among other causes. Today all eyes are on Iowa, as caucus-goers provide the first hard data on which candidates are truly up and truly down in the only currency that matters—the vote. 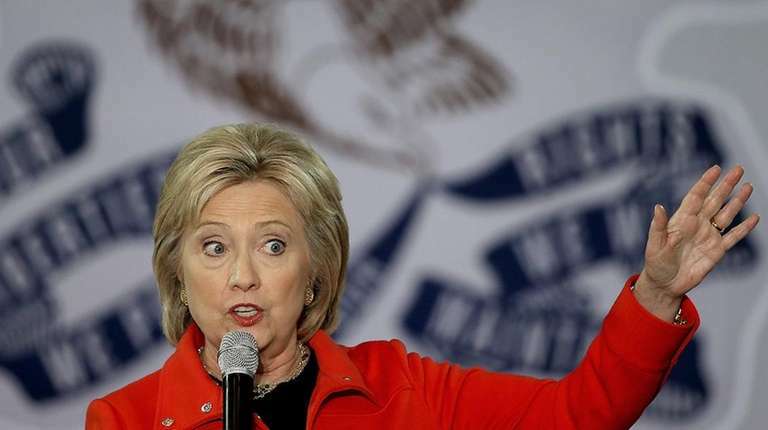 Clinton is looking to avoid being overtaken by Sanders’ insurgent progressive vision. Ergo the insistence on her liberal credentials, shared with the senator—but paired with results, which she claims alone. As Democratic and Republican candidates criss-crossed Iowa this weekend making their final pitches to voters, a few surrogates—including Perez—made their way to New Hampshire, site of the next round of voting on Feb. 9. About 15 Clinton volunteers considered the other secretary’s pitch, before beginning a round of phonebanking. They were not yet the center of political attention, for another 24 hours at least, during which time Iowa will play first judge for Clinton and Sanders’ progress.